We love learning about our student’s dance journeys, and for you to learn a little about what drives them to DANCE! Perhaps you have similar stories, common goals, or will find new inspiration and motivation to dance. Dave & Shirley Kisor have been Fort Wayne Arthur Murray students since January 2017. Working through their Associate Bronze program, they have participated in numerous studio events, found a passion for learning and dancing, and have even taken exchange lessons at the Arthur Murray Studio in Bellevue, WA while on vacation! Here is a little peek into their dancing adventures. What influenced you to begin dancing at Arthur Murray’s? At first, dance lessons were a birthday gift intended as something to do during the winter. Everyone at Arthur Murray was so welcoming and patient. We were having so much fun, we just had to continue! Now that you have these new skills, do you find more opportunities to go out dancing? Yes! Now that we are more comfortable with our dancing, we take advantage of opportunities to dance. For example, during vacation, we found a ballroom with open dance nights and discovered the dance community is very inviting! We danced with total strangers and had a great time. We also have more fun at weddings because we are more comfortable on the dance floor. Now we look for opportunities to dance at community events. You just participated in Fort Wayne’s Showcase. Tell us about your experience. Exhilarating! Fun! Challenging. First, we participated in the “Wild Wild West” formation group. The staff put together an incredibly fun routine: the choreography, costumes, and the music! We enjoyed the camaraderie of our team as we practiced and pulled together for the performance. The [freestyle] heats were challenging because we were a bit nervous at first. But, that’s what is great about Showcase, you have multiple heats and become more confident. Everyone was supportive and it was great to see all levels of dancers. Later, we relaxed as we enjoyed dinner and open dancing. Overall, the whole Showcase experience was a blast and we left with a sense of accomplishment! Why would you recommend other students participate in events like Showcase, Newsome Twosome, and Medal Ball? These events provide an opportunity to work toward goals. In the process of preparing for these events, your instructors helps you stretch your abilities, incorporating what you have learned during lessons and adding refinement in routines or patterns. It gives you a sense of adventure and accomplishment. At Newsome Twosome events, you choose a song or style of dance that “speaks to you.” It’s fun to see all the work and personality students put into their dancing! Also, spending time at these events allows us to connect with students at different levels of dancing who have been where you are. This gives you a sense of direction, reassures where you are at, and adds encouragement to your future ambitions. Focusing on their lesson with Robert Green while group class and other lessons are in full swing! How has learning to dance and spending more time together made an impact of your relationship? Dancing adds another dimension of closeness. When we dance, we focus on each other, with no interruptions or distractions from the typical “noise” of everyday life. We have a greater appreciation of our time together. Were there any barriers you feel like you’ve overcome throughout your dance journey? At first, we avoided the Friday evening parties. We were so insecure about our dancing and about dancing with others. We were continually encouraged by the staff to attend the parties and once we took their advice, we realized how much more we got out of dancing! Now, we look forward to Fridays! Why have you chosen to continue your dancing with Arthur Murray’s? What keeps you coming back for more? The infectious attitude of the instructors and staff keep us coming back… they have this energy about them. They are excited about dancing and want to share that excitement! Somehow they manage to keep lessons intriguing by adding new “layers” to our current level of dance. The more we learn, the more we want to learn. 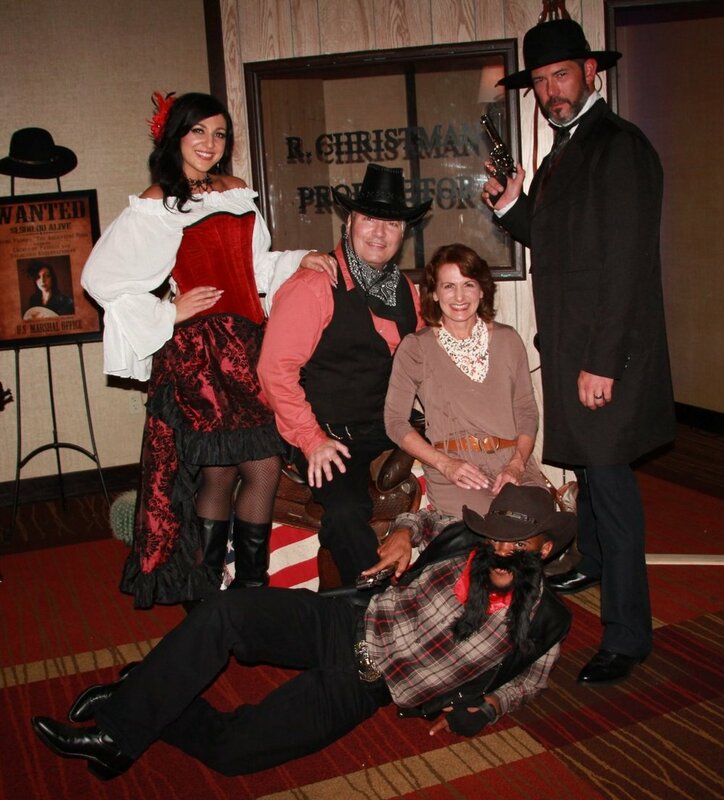 Enjoying the photo booth at the Wild West Showcase with their instructors, Quinton & Theresa MacAdam & Robert Green. What is your favorite dance moment together? Have you ever danced so much that it felt like your legs were going to fall off? Yes, October 5, 2018 - Cardio Challenge Party! What has been your favorite themed party? What is your favorite music genre for dancing? Jazz, Pop, Country… you name it! What is your secret routine song? Older PostEXPERIENCE THE MAGIC OF SHOWCASE!